Now, I do not review adult books on this blog. HOWEVER I am making an exception because it's been forever since I have reviewed an audiobook and that is ridiculous because June is National Audiobook Month and because I co-host a freakin' audiobook meme. Did you see that movie Julie & Julia? Do you remember how the Julia parts were, like, way, way, way better and more interesting than the Julie parts*? 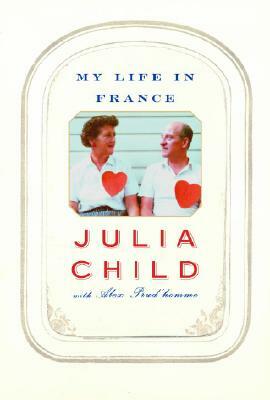 Well, the Julia bits were based on the book My Life in France by Julia Child and her friend Alex Prud'homme. And if you're at all interested in cooking or living abroad or Julia Child or just fascinating memoirs read by excellent narrators, you're going to want to pick up this audiobook. My Life in France is Julia Child's memoir of, well, her life in France. The book starts right as Julia and Paul Child arrive in France where Paul has a job with the US government. Julia chronicles her adventures in Paris, learning French, studying at Le Cordon Bleu, and absolutely tackling the art of French cooking. While in Paris, she meets two women who propose creating a French cookbook designed for an American audience and this labor of love "cookery bookery" is eventually published as Mastering the Art of French Cooking. Although Julia was an accomplished cookbook author, she wrote My Life in France with the help of professional writer Alex Prud'homme, which gives the book a perfect blend of authenticity and readability. I listened to the audiobook of this title and I wouldn't have it any other way. As you know, Julia Child had a pretty distinct voice, but as Kimberly Farr narrated the book, she became Julia to me. I gave myself over to it and it was like Julia was sitting down with me and telling me all about her adventures abroad. PLUS, Farr was able to pronounce all the French words in the book, which I certainly would not have gotten if I had been reading the text. What more can you ask from an audiobook experience? 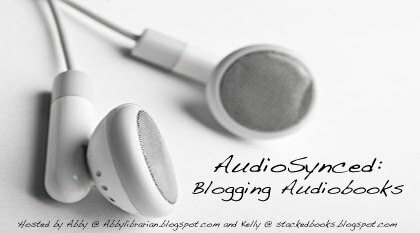 Hey, don't forget to submit your audiobook reviews and links to Stacked for the June AudioSynced Roundup while will be posted on July 1. My Life in France by Julia Child and Alex Prud'homme. Narrated by Kimberly Farr. Knopf, April 2006. Audio published by Random House Audio. Reviewed from audiobook provided by my local library. *That's just, like, my opinion, man. Hey! I'm an Audible affiliate, so if you make a purchase after clicking on one of the affiliate links on this site, I will receive a referral fee.